Installation of any software application should be straightforward, intuitive and, perhaps above all, fast. Furthermore, when you have that software installed, you want to be able to update it as and when you deem necessary, and in a streamlined fashion. CircuitMaker provides a fast, efficient Installation Management System that caters for this very need – a system that not only expedites the initial installation process, but lets you handcraft the features available to that software at any time after installation. To use CircuitMaker requires an account to be setup. This is achieved by registering to become part of the CircuitMaker Community - through the CircuitMaker website. Upon registering you will receive an email welcoming you to the community. This email provides you with a temporary password. This, along with the email address you supplied when registering for an account, make up your CircuitMaker Account Credentials. These credentials are needed during installation of the software. Once installed, these credentials are again used to log-in to the CircuitMaker Community, through the initial page presented when the software is first launched. 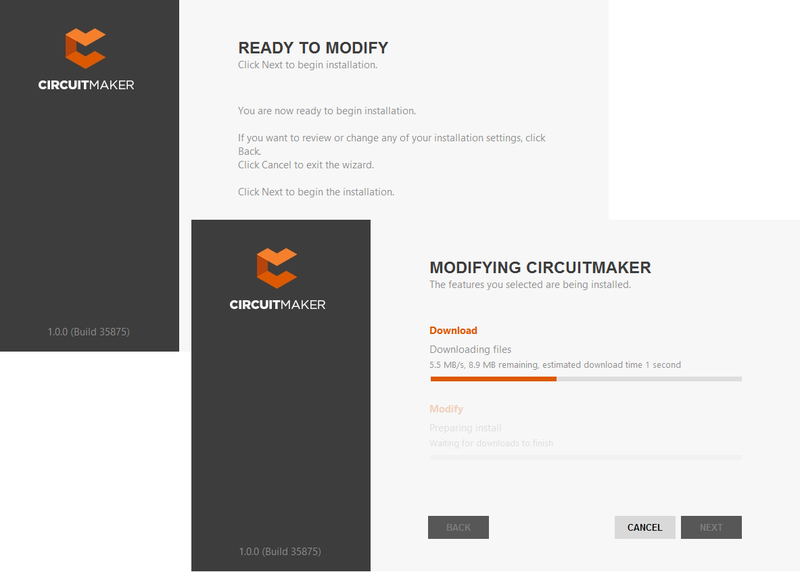 Initial installation of CircuitMaker is performed using the CircuitMaker Installer. This wizard-based installer is accessed by running a small (approx. 9MB) executable – CircuitMakerSetup.exe. This executable is downloaded from the CircuitMaker website, and can be saved anywhere on your hard disk. Each version of the software, starting with CircuitMaker 1.0, has its own dedicated installer. Streamlined installation courtesy of the CircuitMaker Installer. Design Functionality – allowing you to specify which features are installed initially. The PCB Design option provides the base software and core technologies required to perform PCB design. It is always installed and cannot be deselected. Use the remaining options to tailor the install to suit your needs. This will also have an impact on the initial installation time too! Install Location – allowing you to specify the destination folders for the install, in terms of both the Program Files and Shared Documents install locations. These locations become especially important when installing multiple instances of CircuitMaker. The installation itself is streamlined and fast. This allows you to get installed, and up-and-running in the quickest time possible. Once installed, you can further refine your installation, in terms of available features and functionality. 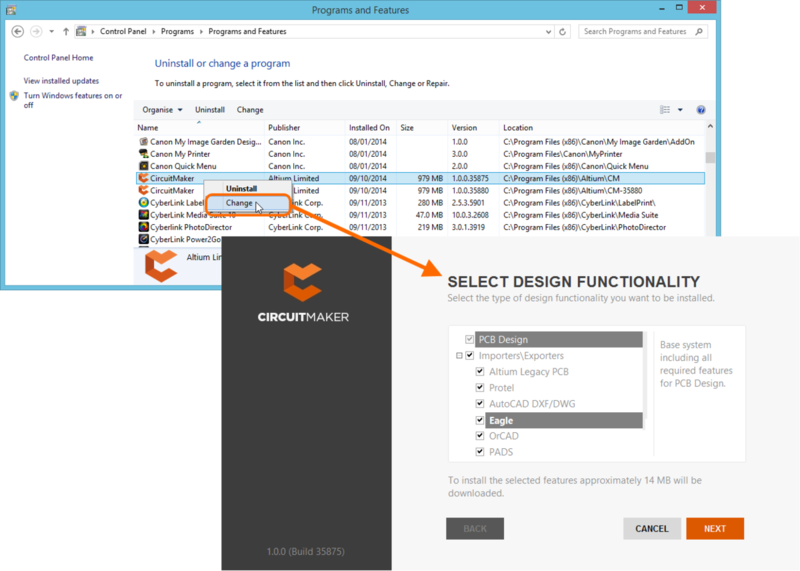 Since CircuitMaker is a solution built for community-based design, you will need to be signed-in to the CircuitMaker Community to use the software. Once signed-in, you will have access to the wealth of design projects and components built by other members of the community, and of course be able to add your own creations for others to see. When you first launch the software, you will be presented with the community's Login page. Enter your CircuitMaker account credentials into the applicable fields and click the SIGN IN button. These are the same credentials you just used during the installation process - your email address supplied when registering, and the temporary password that was supplied to you. You'll need to login to the CircuitMaker Community in order to use the software. Enable the Remember Me option to avoid having to login manually each time you subsequently start the software. It is advised to change your password after logging into the CircuitMaker Community. 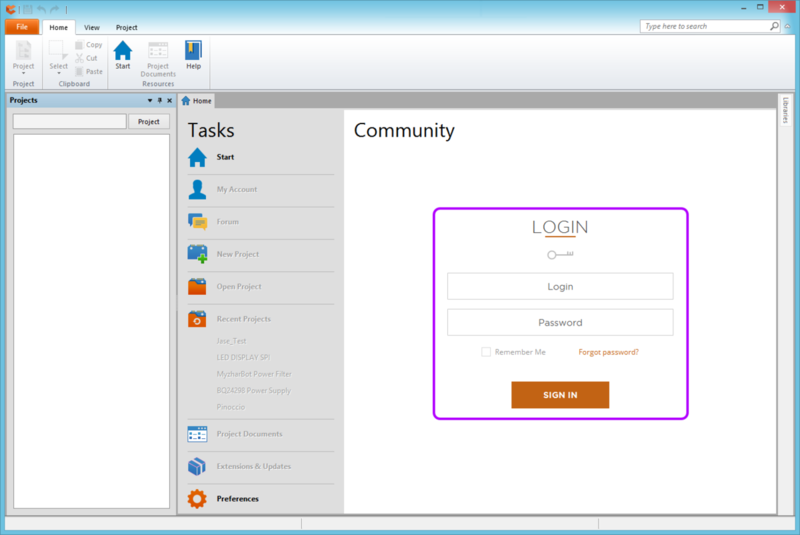 To do so, from the Start page (View | System | Start) simply click the My Account link (in the Tasks pane). Then from the My Account page, click to access the Change Password page. Once the base version of CircuitMaker is installed on a computer (e.g. 1.0), you can either update to a subsequent version (e.g. 1.1, 1.2, etc), or that subsequent version can be installed as a fresh and distinct instance. The Installation System supports the concurrent installation of different instances of the software. The beauty of installing different version instances is that it enables you to quickly access a previous version directly, and independently, whereas an update effectively replaces the earlier version with the later one. 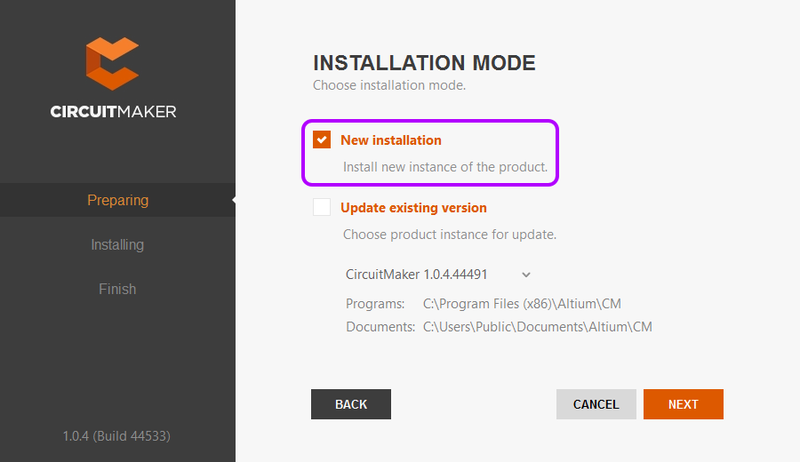 When running the installer for a subsequent version of CircuitMaker, an additional page of the CircuitMaker Installer wizard will be available – Installation Mode. This page gives you the choice of either updating an existing version instance of CircuitMaker, or installing as a separate new version instance. Choose the New installation option to maintain separate version instances of the software on the same computer. Remember to specify different destination folders for the new instance later in the wizard. To install a separate instance, ensure the New installation option is chosen as the mode of installation. The ability to specify different destination folders during the install, in terms of both the Program Files and Shared Documents install locations. The system's use of a Globally Unique Identifier (GUID) for each independent instance. This identifier – which uses the standard 128-bit URN model and is displayed as a 32-character hexadecimal number – is used to uniquely distinguish the application data folders, as well as entries in the registry. When you run a particular instance of CircuitMaker, the system handles, through use of this identifier, only those files and registry entries specific to that instance. The following is a summary of the default installation folders for CircuitMaker, based on a Windows 8/Windows 7 OS. An actual project itself is comitted and released to the Community Vault. The local sandbox instance is used to accommodate local changes to the design, prior to synchronization with the managed project 'master' stored in that vault. For the main program installation and shared documents folders, you have the ability to give those folders meaningful names, which can come in very handy for a machine containing multiple different version instances of the software. But for other folders, they are only distinguished by their GUID. Being able to tell you have the right folder for the right version instance suddenly becomes more difficult. However, help is at hand, to allow you to quickly identify the GUID used for the currently open instance of the software and, armed with that knowledge, pick the right folder through Windows Explorer. The GUID can be identified from the Directory field for Temporary Mesh Data, on the PCB Editor - General page of the Preferences dialog (File » System Preferences). Identifying the GUID used for the active version instance of CircuitMaker. After installing and launching a new version instance of CircuitMaker, the designer is given the opportunity to import preferences from the most recent previous installation at startup. You have full control over whether to import all, or only some of the preferences, with the ability to select which preferences to import at the individual preferences page level. If the option to import preferences on initial startup is not taken, don't worry – preferences can be quickly loaded, at any time, from within the Preferences dialog. Simply click the Load button at the bottom of the dialog, then browse to, and open, the required DXP Preferences File (_Profile.DXPPrf) for the previous version. This can be found in the \Users\<ProfileName>\AppData\Roaming\Altium\CircuitMaker <GUID> folder for that installation. Internally from within CircuitMaker – from the Installed page of the Extensions & Updates area. Externally from within Windows – from the standard Programs and Features page (accessed from the Control panel in Windows 8/7). Access the Extensions & Updates area by clicking the Extensions & Updates link, in the Tasks pane of CircuitMaker's Home page. The Home page is accessed by clicking View | System | , from the main menus, or by using the File » Help » Home command. From the Extensions & Updates page, click the Installed link to access the Installed page for the area. Click the Configure control, at the top-right of the Platform region. 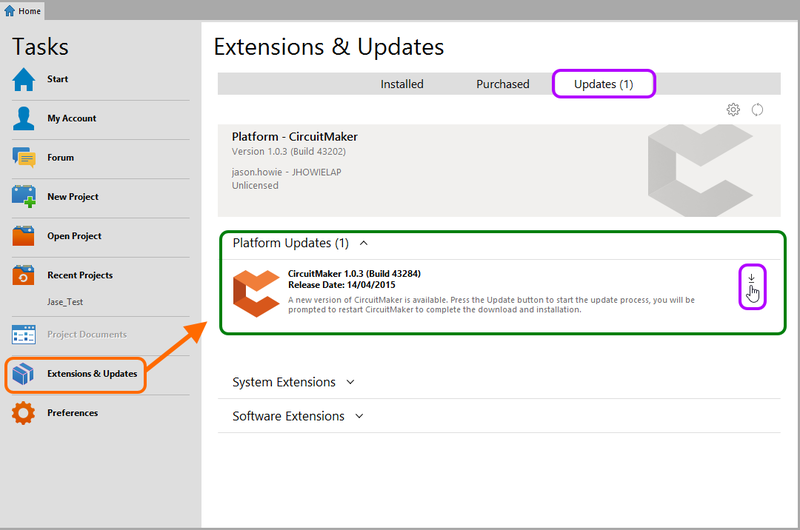 This accesses the Configure Platform page, presenting the core feature set for the software – including platform extensions – and is similar in content, to some extent, to that found on the Select Design Functionality page of the CircuitMaker Installer. Make changes to the core functionality of your CircuitMaker installation by configuring the platform from within the Extensions & Updates area. 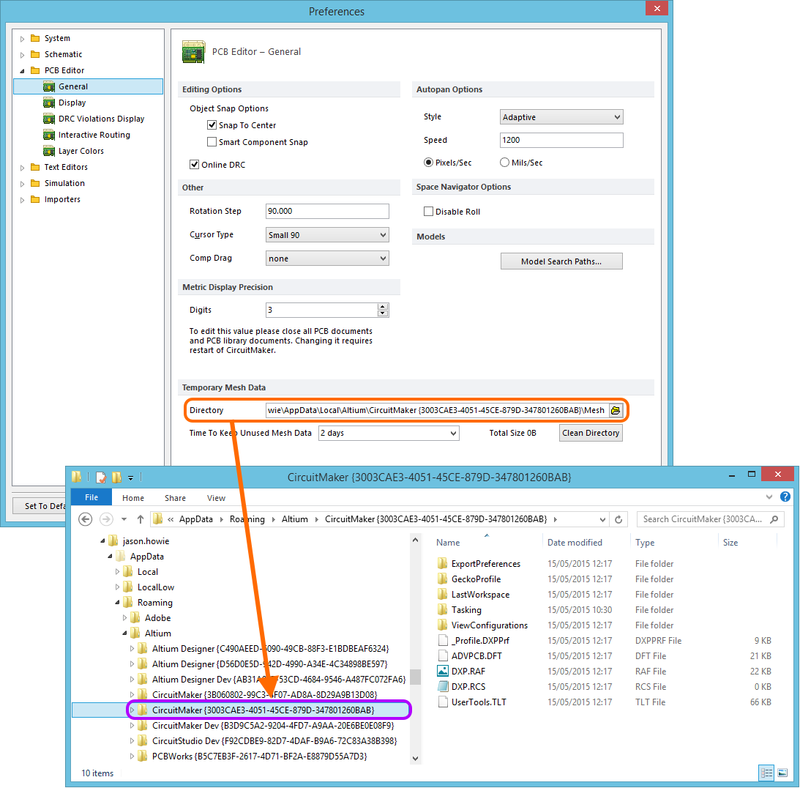 Make changes to the installed core feature set as required and click Apply. A confirmation dialog will appear, click OK to apply the changes and restart CircuitMaker. The instance of CircuitMaker will close and a window will appear showing progress, in terms of download of the files required to implement the change(s), followed by the installation of those files. CircuitMaker will then be restarted. Right-click on the entry for CircuitMaker and use the Change command from the context menu. If you have installed multiple instances of CircuitMaker, ensure changes are being made to the correct instance. It can be a good idea to have the Version attribute displayed as an additional column on the Programs and Features page, so that the correct instance can be quickly verified. 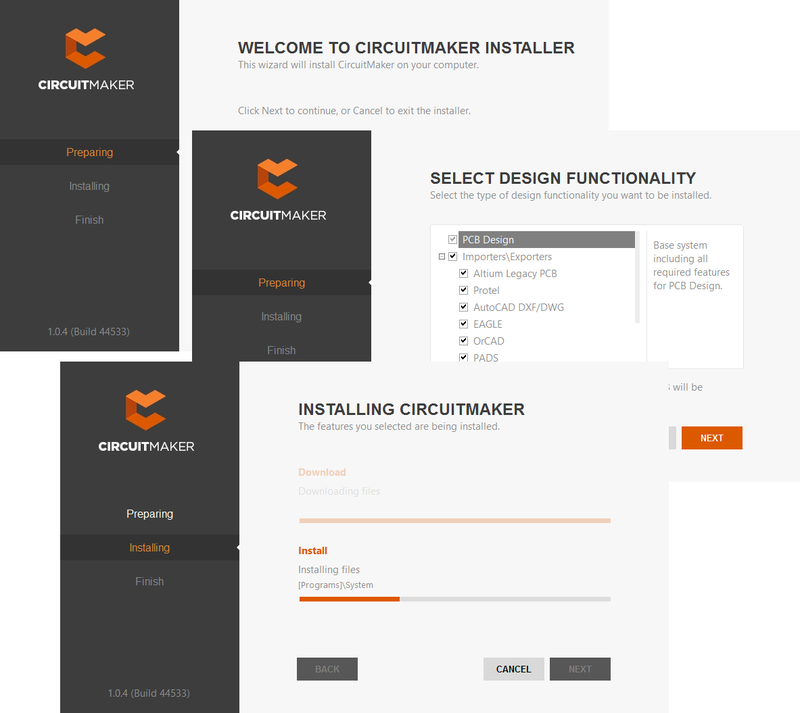 The CircuitMaker Installer wizard will be presented. Login through the Account Log In pop-up window, after which you will be taken to the Select Design Functionality page. 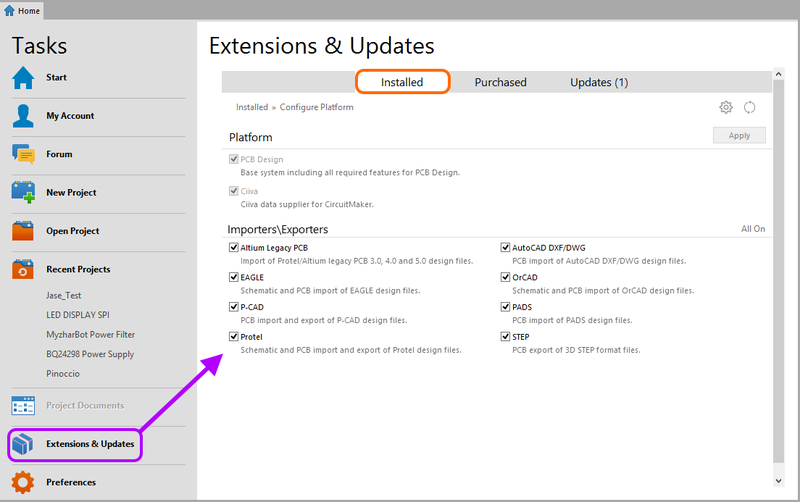 Make changes to the installed core feature set as required and click NEXT. Modify the installation at any stage by changing the core functionality installed. The Ready To Modify page will be presented. At this point, the Installer has all the information it requires to proceed with modification of the installation. If you need to change anything, click the BACK button. If you want to cancel out of the install, click CANCEL. To go ahead and proceed with the modification, click NEXT. The page will change to Modifying CircuitMaker and the files required to implement the change will be downloaded and then installed. Modification of the installation proceeds by downloading the files required to implement desired changes to the software. Once downloaded, those files will be installed. With the modification to the installation complete, either re-launch CircuitMaker by clicking RUN CIRCUITMAKER, or exit the Installer without launching the software, by clicking FINISH. Internally from within CircuitMaker – from the Updates page of the Extensions & Updates area. The software can be set to check for new updates, on the System - General Settings page of the Preferences dialog. Use the drop-down associated to the Check fequency field - in the Automatic Updates region of the page - to specify how often a check is made. Choose from Never, On Start-up, Every day, Every 3 days, Every week, Every 2 weeks, and Every month. The default checking frequency is Every 3 days. From the Extensions & Updates page, click the Updates link to access the Updates page for the area. When a new version of the platform is available, it will be presented in the Platform Updates region of the page. If multiple updates are available, these will be listed, with latest at the top. This enables you to select which specific version you wish to update to. If there is no later version of the platform available, then the text Platform is up to date will be displayed in the Platform Updates region to reflect this. Update to a new version of CircuitMaker, directly from within the current version. Click the icon to proceed with the update. A progress bar will appear, showing progress of the download (essentially getting the installer for the later version from the source vault). Should you need to cancel the update, simply click its associated cancel icon ( ). A confirmation dialog will appear, alerting you to the fact that a restart is required to install the platform update – click Yes. The instance of CircuitMaker will close and a window will appear (essentially the Updating CircuitMaker page of the installer dialog) showing progress, in terms of download of the files required to implement the update, followed by the installation of those files. Verification that you now have the later version of the platform installed can be made either from any page of the Extensions & Updates area, or from the File » Help » About splash screen. 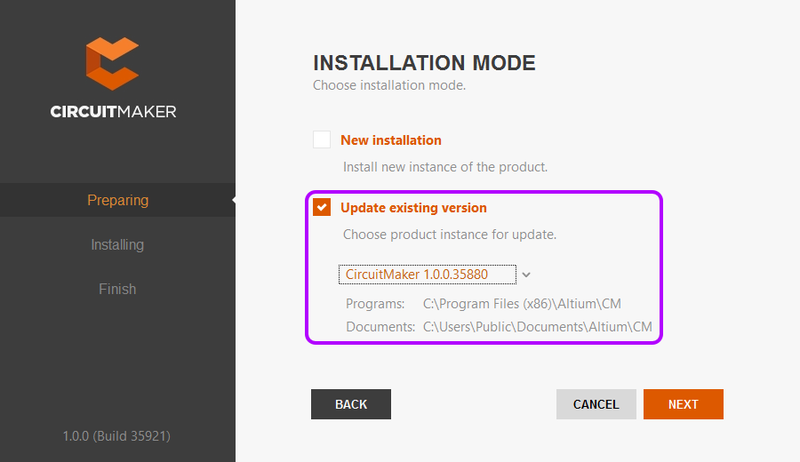 Updating your current instance of CircuitMaker to a later version, is performed during installation of that later version. Download and run the CircuitMakerSetup.exe file associated with the latest version of the software. Follow the installation process, using the CircuitMaker Installer for the new version. After agreeing to the End-User License Agreement, you will be presented with the Installation Mode page. This page gives you the choice of either updating an existing version instance of CircuitMaker, or installing as a separate new version instance. Choose the Update existing version option, then use the drop-down field to select the specific instance of the software you wish to update. The Program Files and Shared Documents install locations will be summarized based on the chosen instance. Choose to update an existing instance of CircuitMaker during installation of a later version of the software. Click NEXT. The Ready To Update page will be presented. At this point, the Installer has all the information it requires to proceed with update of the existing installation. If you need to change anything, click the BACK button. If you want to cancel out of the install, click CANCEL. To go ahead and proceed with the update, click NEXT. Login through the Account Log In pop-up window. Once this is done, the page will change to Updating CircuitMaker and the files required to implement the update will be downloaded and then installed. Update of the installation proceeds by downloading the files required to implement required changes to the software. Once downloaded, those files will be installed. With the update to the installation complete, either re-launch CircuitMaker by clicking RUN CIRCUITMAKER, or exit the Installer without launching the software, by clicking FINISH. 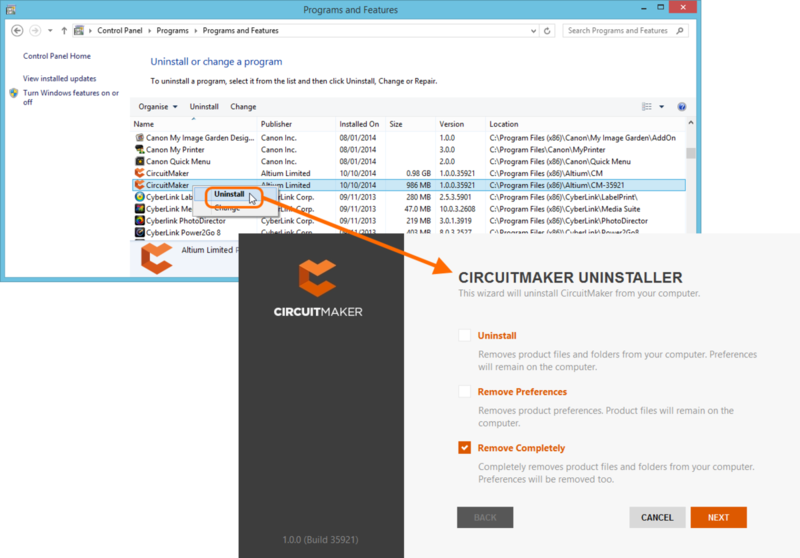 Uninstalling CircuitMaker is performed using the CircuitMaker Uninstaller. This wizard-based uninstaller is accessed from the standard Programs and Features page (accessed from the Control panel) in Windows 8/7. Simply right-click on the entry for CircuitMaker and use the Uninstall command from the context menu. If you have installed multiple instances of CircuitMaker, ensure that the correct instance is being uninstalled. It can be a good idea to have the Version attribute displayed as an additional column on the Programs and Features page, so that the correct instance can be quickly verified. Uninstalling the software is streamlined, courtesy of the CircuitMaker Uninstaller. Uninstall – removes the install folders (program files and shared documents locations) but leaves preferences-based folders alone. This enables you to have a build that is not currently installed, but whose preferences can still be reused, for example by loading into another installed version. Remove Preferences – removes just the preferences-based folders, covering system application data and security files, user application data files and user local application data. Remove Completely – total removal of the entire installation (i.e. installation folders and preferences folders). Choose the uninstall action required. If you want to cancel out of the uninstall, click CANCEL. To go ahead and proceed with the uninstall, click NEXT. The page will change to Uninstalling CircuitMaker and the chosen action will be processed. Once the uninstall is complete, simply click FINISH on the Uninstallation Complete page of the Uninstaller. 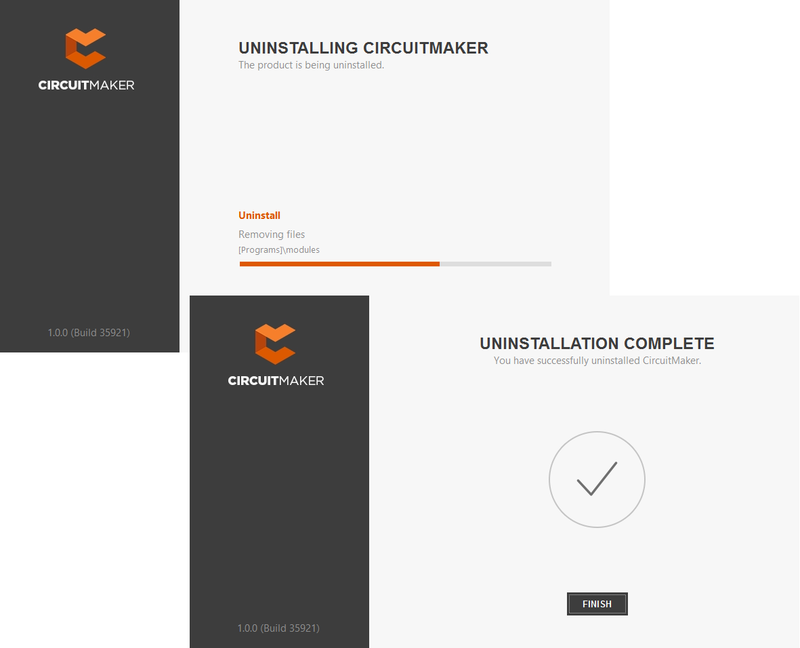 The CircuitMaker Uninstaller in action!